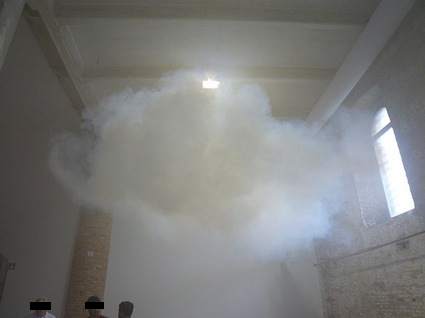 A picture of SCP-459's effects, with Dr. ██████, Agent █████, and D-3826. Description: SCP-459 appears to be a standard home thermostat. The item is equipped with a small display, four buttons, and two dials on either side of the screen; the two buttons on the right side raise and lower temperature, and the other two appear to affect relative humidity in the area - However, these buttons will only work when both dials are set to the off position. The left dial (Dial 1) is marked with several standard weather conditions including "rain", "snow", and [DATA EXPUNGED]. The fourth and fifth positions' lettering has worn off, and have been marked as 4 and 5. The fourth and fifth positions have been respectively designated "T-storm" and "Hurricane". The right dial (Dial 2) has ██ different settings, all of which are unmarked. The rightmost positions on each dial are the "off" positions. Addendum 459-1: SCP-459 was discovered in a suburban home in ██████████, ██████, after reports from neighbors of loud noises and bright flashes at night. Authorities' first attempts to investigate resulted in [REDACTED], attracting the Foundation's attention. A group of agents with standard protection gear cut power to the house and proceeded to retrieve SCP-459 without incident, wherein all agents returned to Site-██ with the device. The bodies of [REDACTED], the occupants of the home, were recovered as well; cause of death is officially listed as a gas leak. Results: After five minutes of inactivity, Dr. ███████ exited the test chamber due to a spontaneous nosebleed. At 07:32 after activation, a breeze began to blow throughout the room, increasing in speed very rapidly, after which the view was obscured by large amounts of unidentified red material [DATA EXPUNGED] sensors clocked the wind speed at 428 km/h before they were destroyed [DATA EXPUNGED] entire East wing locked down. Weather did not subside for a week after the incident and further testing was suspended until the test chamber could be fully inspected and repaired. Inspection of the chamber showed large quantities of ammonia, hydrogen sulfide, and other chemical compounds known to make up Jupiter's atmosphere.